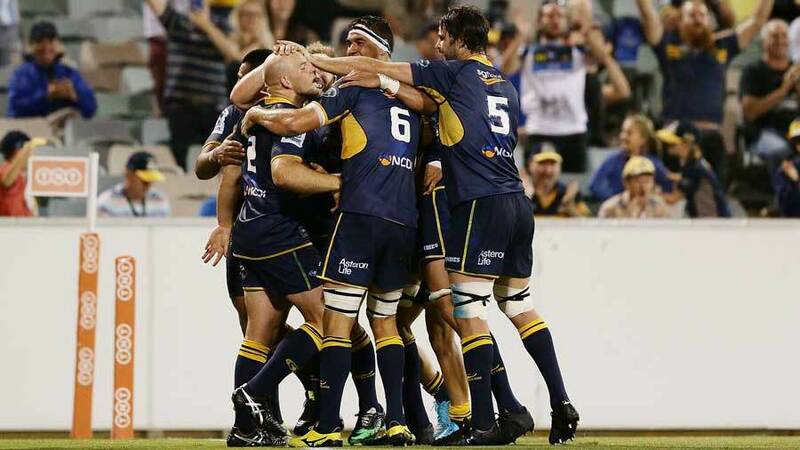 The Brumbies delivered an emphatic statement of intent with a dominant performance in all aspects of the game to record a thumping victory against the Hurricanes. The Hurricanes, 2015 Super Rugby runners-up after defeating the Brumbies by 20 points in the semifinals, opened the scoring with a penalty from Beauden Barrett in the third minute, but they were never in the hunt thereafter. Christian Leali'ifano squared the ledger with a penalty six minutes later and then converted tries from Wallabies team-mates Tevita Kuridrani and AIS Sports Personality of the Year David Pocock either side of a score on Super Rugby debut from Argentina's Pumas scrum-half, Tomas Cubelli, as the Brumbies went to the sheds with a 21-point advantage. Leali'ifano converted four mores tries in the second stanza, from Scott Fardy, fellow co-captain Stephen Moore, playing his 150th Super Rugby match, Josh Mann-Rea, scoring his first try in his 30th Super Rugby match, and Sam Carter as the Brumbies ran roughshod over the visitors. The Hurricanes, so prolific in reaching the title decider last season, were subdued through and scored only after capitalising on a poor kick from Matt Toomua, Nehe Milner-Skudder cutting loose in open space before feeding Ngani Lauampe to touch down on debut after joining from Manawatu Turbos. Brumbies coach Stephen Larkham had been working on a more open attacking game for the new season, and it was on show for all to see as his players, looking fit as ever, blew the Canes away with their pace and choked them with a rock-solid defence that not even world-class halves pairing TJ Perenara and Beauden Barrett could break. It was a very different game to last year's semi-final, which went the Wellington side's way. The game started at lightning speed and a flurry of big hits that'll no doubt have bodies sore on Saturday. Kuridrani burrowed over from close range for the game's first try, and darting scrum-half Cubelli added a second in the 28th minute for a 17-3 lead. But it was a flashy lineout move just minutes before half-time that left the crowd both stunned and stoked. An unselfish pass from Moore to Pocock sent the back-rower over for his first try of the year - and, unusually, it came from a running play not a rolling maul. Fardy laid on another five-pointer soon after the break, taking their lead to 28 points before the former NRL player Ngani Laumape scoring on debut after the ever-dangerous Milner-Skudder had found some space on the left edge. Moore, Josh Mann-Rea and Carter then crossed for the Brumbies in the final half-hour, and an apparent leg injury to lock Rory Arnold appeared to be the only sour note for the Brumbies.